Having supported Paul Weller at his personal request on his five night residency at London's Roundhouse earlier in the year, Cow return with a new album ‘Dedicated To... The Mighty Drum’. The album, which is available now, was recorded at Paul Weller's Black Barn studios, and features the man himself on several tracks, including new single ‘Black Harvest’. 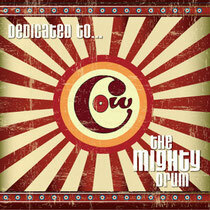 Cow were formed in late 2006 by Mark Boxall and Maxine Cook. The album sees them going back to the acoustic roots of their debut album with 10 new self-penned songs, drawing influences from pop, soul and psych. The first single taken from the new album is ‘Black Havest’ and Mark says of the single: "It deals with the struggles and frustrations of broken Britain as it attempts to recover from the riots of last summer and the recession which has blighted our economy for so long."